The IMDb dataset is a great source for everyone loves movies and numbers. After I had figured out how to import the data into a local SQL database, the first thing I did was to look at the age of the actresses and actors during filming. It turns out that the average actress is, with a median age of 32, seven years younger than her male counterpart who is on average 39 years old. 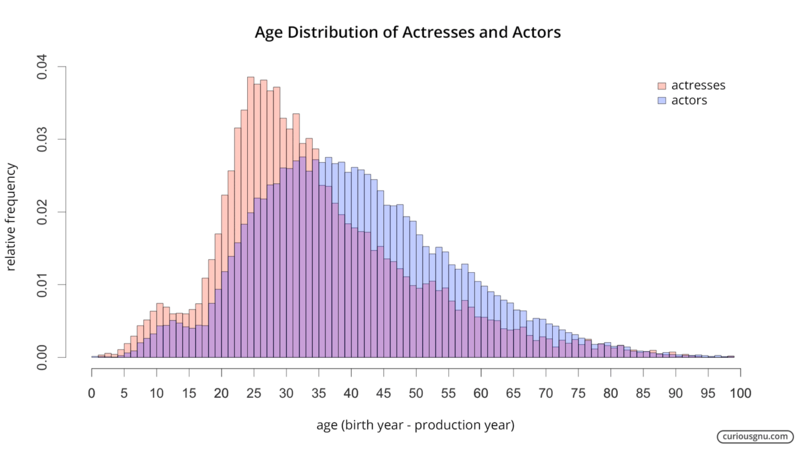 The diagram below shows that the distribution of ages of actresses is more skewed to the right (γ1=.912) than those of ages of actors (γ1=.483). This suggests that there is a relatively higher demand for actresses under the age of 35. Interestingly we do not see such an apparent age preference in the casting of actors. The sample consists of all roles played by actresses (n=21,551) and actors (n=50,165) in U.S. movie released between 2000 and 2015, with more than 10,000 IMDb-Votes. By the way, in the United States, the median age of females and males is 39.2 years and 36.5 years respectively (The World Factbook, 2015). What's the age difference in movies?